As Spotron’s Marina Spa makes a grand entry into the Nigerian market, Swissgarde Distributors welcome this product from its sister company that is under the Umbrella of their Parent company, the ever dynamic Ascendis health direct. No doubt, Marina Spa will do well in Nigeria because of the wonderful extracts it contains and the features of the extracts. Let us have an in-depth study of this product so that we can appreciate its rich splendor. This a detailed look at the products and the key ingredients, hope you will have the patience to read everything. 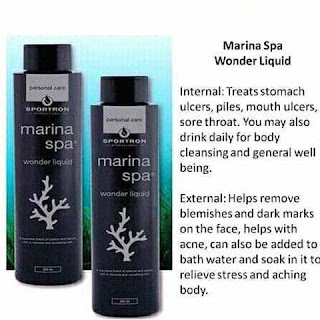 This unique marine-based solution has been enriched with Calendula extract and a blend of 4 special oils (rosemary, avocado, castor, and eucalyptus oil) to revitalize the body internally and externally. It is a nutrient-rich liquid which promotes overall well-being when taken orally. When applied topically to the skin, it nourishes, energizes and moisturizes the skin, by promoting collagen production. Sportron's Marina Spa contains a unique brown seaweed that has been harvested in an unspoiled marine nature reserve on the South African West Coast. The wild seaweed plants thrive in their natural ecosystem of unpolluted sea-bed forests that are nourished by mineral-rich oxygenated waters flowing from Antarctica. This super-plant is known for its rich concentration of vitamins, minerals and amino acids which are immensely beneficial to the body and skin, and certified by the Personal Product Council of South Africa. Seaweed components stimulate skin collagen production, improve the skin's defense mechanism and boost deep skin hydration, which ultimately improves overall skin health. Calendula is an annual flower native to the northern Mediterranean countries. It is the dried flowers of the marigold, known for its soothing effect on skin, and promotion of skin health. Its name refers to its tendency to bloom with the calendar, usually once a month or with every new moon. The Egyptians considered them to have rejuvenating properties. In the Hindu world, the flowers were used to adorn statues of gods in their temples, as well as a colorant in food, fabrics, and cosmetics, and of particular interest, in the 18th and 19th-century calendula was used to color cheese. Calendula has historically been used as a food, adding flavor to cereals, rice, and soups. The fresh petals can be added to salads for their brilliant color. As recently as 70 years ago, American physicians used calendula to treat amenorrhea, conjunctivitis, fevers, cuts, scrapes, bruises, and burns, as well as minor infections of the skin. Calendula creams and washes are still used to disinfect minor wounds and to treat infections of the skin. The antibacterial and immunostimulant properties of the plant make it extremely useful in treating slow-healing cuts and cuts in people who have compromised immune systems. The herb stimulates the production of collagen at wound sites and minimizes scarring. Gargling calendula water may ease a sore throat. Because of the vivid and brilliant color of calendula, it was thought to possess powers for the protection and benefit of humans… An often overlooked application of this herb is the treatment of post-mastectomy lymphedema. The herb will not reduce swelling, but it will reduce pain. Avocado oil is popping up as an ingredient in many healthy foods. People love it for its mild flavor in cooking and lack of scent in beauty recipes. Avocado oil is one of the richest natural sources of Vitamin E. It contains polyhydroxylated fatty alcohols which can reduce skin damage, tighten skin and reduce wrinkles. In France, the avocado was part of a special formula that was given prescription status for its ability to help with cartilage strength and repair. Combined with the natural anti-inflammatory properties of avocado, it is easy to see how this oil may be beneficial for reducing joint pain. The effects seem to be from the internal use of avocado and its oil, suggesting that the nutritive properties may have the benefit. It is interesting to note that while this formula produced a reduction in pain and is marketed in Denmark for this purpose, no structural changes were noticed. In other words, avocado may be helpful in reducing joint pain but probably won’t repair the actual damage to the joint. Avocado oil, on the other hand, has consistently shown positive effects on heart health. In fact, large studies have shown that the monounsaturated oils in avocado are excellent for the heart. Avocado is considered a cholesterol-lowering food and may improve the balance of HDL and LDL in the body. Typically derived from the herbs peppermint, eucalyptus, and pennyroyal, menthol is a compound made from herbal volatile oils that have many potential health benefits. Applied topically or taken orally, menthol has been shown to help treat gastrointestinal problems, pain, inflammation, and congestion. Menthol acts as a carminative, meaning that it prevents and treats gas in the intestines. Menthol also relaxes the intestinal muscles and prevents spasms. Additionally, menthol has pain-relieving and anti-inflammatory actions note the University of Pittsburgh Medical Center. Menthol’s potential use in treating respiratory conditions stems from its ability to dilate the bronchioles, says the Memorial Sloan-Kettering Cancer Center. Menthol’s use in treating colds, flu, and bronchitis is also related to its expectorant actions, which involves thinning and loosening mucous congestion. Menthol has been used to help treat a wide variety of gastrointestinal ailments. For example, menthol can prevent or treat gas and bloating, making it a potential assistive treatment for irritable bowel syndrome, indigestion, and colic says the University of Michigan Health System. Menthol can also be applied topically to help to relieve itching and inflammation due to contact dermatitis and hives. Topical menthol also helps to relieve headaches, states the University of Maryland Medical Center. Additionally, people have taken menthol orally to treat asthma, bronchitis, colds, flu and other respiratory ailments. Eucalyptus oil is also popularly used as a fragrance in perfumes and cosmetics and is found in mouthwashes, liniments and ointments, toothpaste, cough drops, and lozenges. Mouth care: Rosemary essential oil is a disinfectant and is often used as a mouthwash. It also helps in removing bad breath. By removing oral bacteria, rosemary essential oil can prevent gingivitis, cavities, plaque buildup, and other damaging dental conditions. Skin care: Rosemary essential oil is not used in skin care as extensively as it is used in hair care, but it does have antimicrobial and antiseptic qualities that make it beneficial in efforts to eliminate eczema, dermatitis, oily skin, and acne. Topical application of the essential oil or regular massage with the oil helps in toning your skin and removing dryness. It can also give your skin a healthy, even glow when regularly applied, or when it is the main component of your moisturizers and other creams. Boosting mental activity: Rosemary essential oil is an excellent brain and nerve tonic. It is often used by students during exam times because it increases concentration and helps in studying efficiently. It stimulates mental activity and is a good remedy for depression, mental fatigue, and forgetfulness. Inhaling rosemary oil seems to lift your spirits immediately. Whenever your brain is tired, try inhaling a little rosemary oil to remove boredom and renew your mental energy. Pain relief: The ability of rosemary essential oil to relieve pain has resulted in its extensive use in treating headaches, muscle pains, rheumatism, and even arthritis. Massaging the affected area that is in pain with rosemary essential oil can give quickly relieve the pain. Vapor baths with rosemary oil are also found to be effective in the treatment of rheumatism. It has certain anti-inflammatory qualities as well, which makes it very good for relieving the pain from sprains and joint aches. Furthermore, it is known to stimulate blood circulation, which can relieve pain and also aid in coagulation of wounds for faster healing. Aroma: Rosemary has a mesmerizing aroma, which makes rosemary essential oil an excellent inhalant. The oil is used in room fresheners, cosmetics, beauty aids, food, bath oil, candles, and perfumes because of its unique and intoxicating aroma. When the oil is inhaled, it can boost mental energy and is also known to clear the respiratory tract. Many people spray a mixture of rosemary essential oil and water to remove bad odors from room and objects. Respiratory problems: The benefits of rosemary essential oil in treating respiratory problems are well-researched and supported. The scent of the oil has been shown to give relief from throat congestion, and it is also used in the treatment of respiratory allergies, colds, sore throats, and the flu. Since rosemary oil also has antiseptic qualities, it is also effective for respiratory infections. The oil is antispasmodic and is therefore used in some treatment programs for bronchial asthma. There are various other claims regarding possible health benefits of rosemary oil, including its usage for disorders in a menstrual cycle, menstrual cramps, peptic ulcer, urine flow, prostate, gallbladder, intestine, liver, cataract, heart, sperm mobility, leukemia, kidney stones, and associated pain. Research is currently being performed to study its potential in treating various types of cancers including those of the colon, stomach, breasts, and lungs. Rosemary oil may, at times, cause allergic reactions, so it should only be used if prescribed or after thorough consultation with your medical specialist. Since rosemary oil is volatile in nature, the oil has occasionally caused vomiting and spasms. Therefore, it should never be ingested. It is strongly suggested that rosemary essential oil should not be used by pregnant, breastfeeding, or nursing women. Excessive use of the oil may even lead to miscarriage or disability in the fetus. Rosemary essential oil is used extensively in aromatherapy due to its versatility as a welcome aroma in so many popular combinations. The oil blends well with frankincense, lavender, clary sage, cedarwood, basil, thyme, citronella, lemongrass, elemi, geranium, chamomile, peppermint, and cardamom. Gargle with MARINA SPA 2 - 3 times daily. I want that marna spa ,so how do i get it?